Divide the fruits between four glass serving dishes or wine glasses and drizzle a tablespoon of the liqueur over the top. To make the mousse, place the chocolate in a large heatproof bowl over a pan of gently simmering water. Leave to melt for 2-3 minutes. When it has all melted, remove from the heat and allow to cool slightly. Beat the egg yolks into the chocolate with the softened butter and the remaining Grand Marnier or Cointreau. In a clean bowl whisk the egg whites with the salt until they form stiff peaks. Carefully fold into the chocolate mixture using a large metal spoon until completely incorporated. 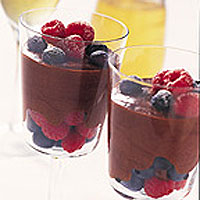 Spoon the chocolate mousse over the fruits and place in the fridge to set for at least 2 hours. Remove the mousse from the fridge about 30 minutes before serving, to soften slightly. Just before serving, decorate each glass with reserved fruits and a dusting of icing sugar.